in the heart of the Mission. 17th Street Athletic Club features two fitness spaces: the Gym & the SM Cycle Studio. The SM Cycle Studio has 30 Stages bikes in a glass-walled room (pictured above) You can wear normal cross-training shoes, but you're welcome to bring your cycling shoes with SPD cleats. 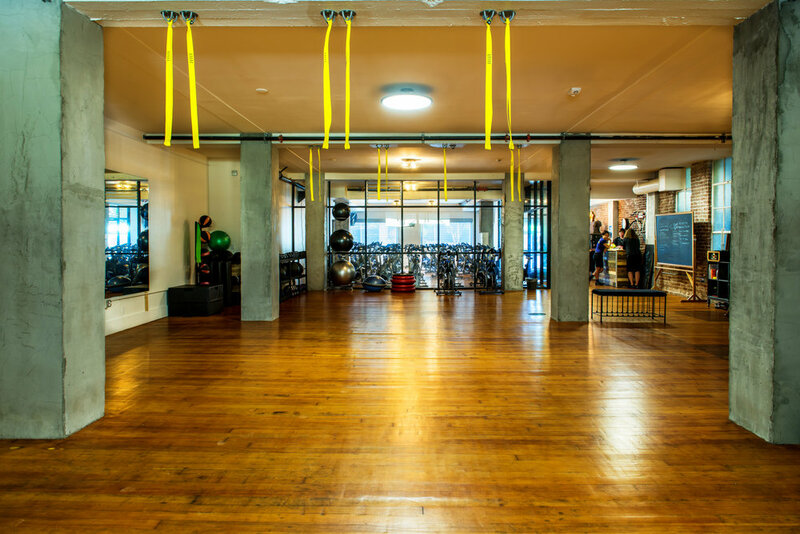 The separate Gym where we hold our TRX, strength, circuit, and core classes features 16 TRX suspension training systems, medicine balls, and a range of free weights. Our studio also features a kitchenette and gathering area for social events. There are two bathrooms, one with a shower, please BYO towel. We're proud to share our space with a bike repair shop, Dirty Wrenches, whose motto is “No job too small; most too big.” Dirty Wrenches can change a flat, clean your chain, put cleats on your shoes, or do other (very small) repairs while you take a class.